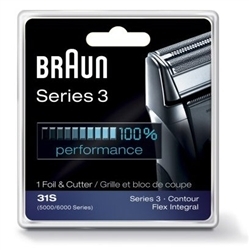 Braun Flex Integral, Contour Series 3 Replacement Shaver Heads 31S (5000 series, 6000 series) Foil and Cutter Set. Braun has refined the act of shaving through expert engineering and a steely-eyed focus on detail. 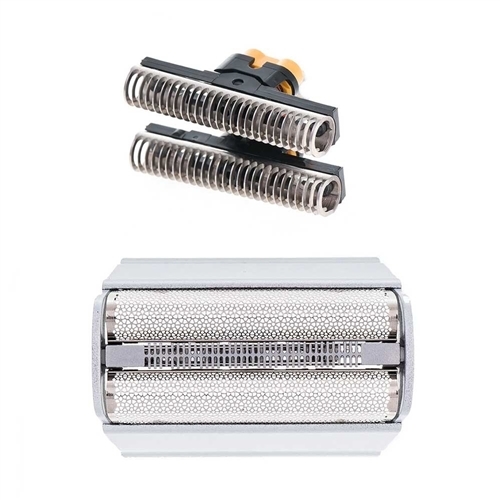 German engineering applied to the electric shaver has brought forth some of the most superior shaver designs on the market today. Among these innovations have been the Braun Flex Integral, Flex XP and Contour Series 3 shavers. 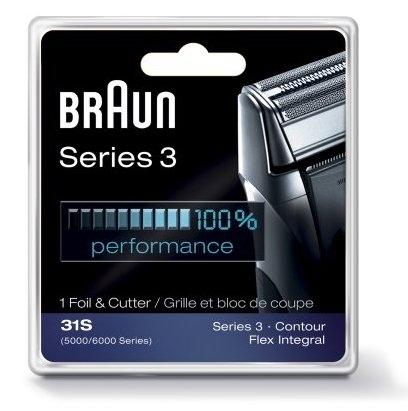 Braun 31S replacement shaving head foil and cutters (formerly 5000 / 6000 series) can restore top performance to your electric razor with little effort thanks to its easy-to install design. Your Braun Contour or Flex XP shaver does a tip-top job day after day easily and comfortably. Your shaving foils are ultra-thin to provide a close shave, but being thin they are also vulnerable to damage and wear. When a hole or dent develops in your Braun shaver foil, it can impact shaving performance, and even cause injury. It is also important to remember, after a time (typically 12 to 18 months), they can begin to dull. You may notice that it takes longer to shave, that you have to move the shaver in more directions, or that it feels like the hairs are being pulled. These signs are a clear indication that it is time to replace your worn heads with genuine Braun 31S replacement shaving heads. Braun 31S heads fit the following shaver models: 3614 5015 5311 5314 5315 5414 5415 5416 5417 5418 5427 5441 5442 5455 5465 5466 5468 5476 5477 5478 5485 5503 5504 5505 5506 5507 5510 5515 5520 5525 5550 5550FS 5610 5611 5612 5613 5614 5665 5691 5703 5704 5705 5706 5720 5721 5722 5723 5724 5735 5770 5774 5775 5776 5790 5791 5795 5885 6510 6515 6518 6520 6520B 6521 6522 6525 6550.